Here is something a little more from the dark side. Not to be overly Gothic, I was simply fascinated by the unique aspect of HR Giger and his artistic creativity. These chairs may look a little like the set of Alien and that’s because his work on the set and creatures won HR Giger an Oscar in 1980. 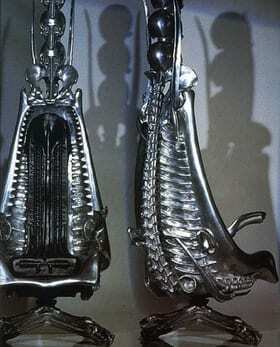 Giger who first studied architecture and industrial design ventured into interior design in 1966. I particularly like the Elegant Black Chair ($2250) for its more mainstream design as his collection can get very far out. Also shown is his Marbelized Harkonnen Chair that is more indicative of his specialized flair ($13,500). Galerie Morpheus International which specializes in works of the “fantastique” has many of Giger’s production and wants to expand the awareness of quality contemporary furniture.